The Grand Banks 42 MY ‘Grand Finale’ now named ‘Suroan ‘ and her proud new owners were waiting for us at the Vero Beach Marina. We had not previously met Al and Sue, but had spent time discussing their training needs and expectations by phone and email. Together the four of us used our detailed ‘pre departure check list’ to carefully go through the boat above and below decks, we then made the trip to West Marine for Coast Guard safety gear, spare fuel filters and other necessary bits and pieces. The next morning after a stop at the marina fuel dock to top the tanks, we got underway for Harbor Isles Marina in Ft. Pierce. The protected wide fairways and floating docks Harbor Isles and nearby Faber cove make an excellent training location for almost every variety of docking and anchoring situation. We begin these training sessions with general engine room orientation by going over all the mechanical and electrical systems, and “hands on” basics such as, required impeller and belt changes and fuel filter replacement. 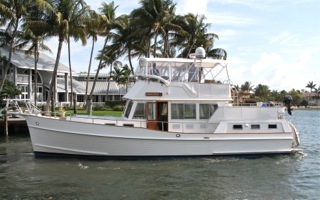 Our focus is to make the new owner familiar with the necessary daily requirements to keep the boat running at it’s best without calling in high priced technical help. Interspersed with time spent below decks, we teach knot tying (the bowline, clove hitch and the square knot), The correct way to coil and throw a line, and safety on deck. 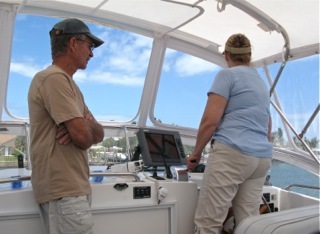 Al and Sue wanted to get a firm grip on “close order” docking and anchoring as soon as possible, so we began many pleasant hours of underway instruction on our way to Miami. We made overnight stops in North Palm Beach and Ft Lauderdale, before reaching our final destination in Miami. Each marina provided completely different and sometimes challenging docking and undocking situations but with our emphasis on ‘low and slow’ all were successful. After 6 days together, Al and Sue returned to the West Coast, leaving us with a ‘to do’ list of 50 items, and the plan to spend 3 more days together in May. Over the past 30 years Wendy and I have been called to deliver boats for a wide variety of reasons. A few examples are: a) Lightning strike, b) Boat owner scares his wife by crossing the Gulf Stream in nasty weather, c) Grounding, d) Abandonment, and now in the case of ‘Serena Ray’ we have to add: e) Previous captain closes fuel return valves and ‘blows up’ injector pump. Within hours of receiving the call, Wendy, our crew Harvey and I were on our way to Skull Creek Marina in Hilton Head , SC with tool kit and delivery gear, ready to solve problems and get underway for Newport, RI. The next day we assisted the Lugger mechanic with installing the new rebuilt injector pump, cleaned up the diesel in the bilge and engine room, provisioned, and secured everything for an offshore passage. We set all the valves to their correct positions and double checked them, changed the primary and secondary fuel filters, cleaned the air conditioning and generator sea strainers and pumped up the steering reservoir to the proper operating pressure. 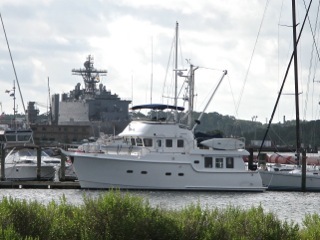 At 1000 August 2, after returning the rental car, we departed Skull Creek Marina with a perfect weather forecast for the 800 NM offshore delivery to Newport, RI. After 10 hours underway, it became obvious that we had a serious fuel contamination problem, and additionally the stabilizer system oil temperature was elevated. 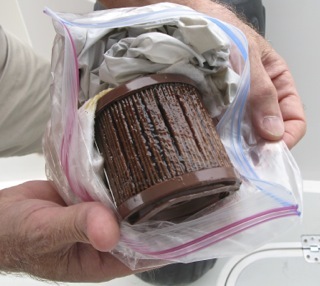 The Racor vacuum gauges were all indicating the need for a filter change but upon inspection the elements instead of being black and nasty as we expected, were light brown in color and ‘looked fine’. We were able to run for about 6 hours on a new 10 micron Racor element before showing high vacuum and in one instance, complete main engine shut down. 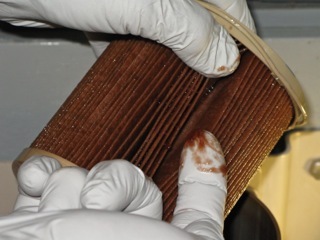 The calm conditions continued around Cape Hatteras, while we struggled to identify the cause of the fuel problem, which finally revealed itself with the swipe of a gloved finger through the pleats of the filter. The element was coated with a substance that can best be described as honey, and from then on was known a ‘Golden Slime’. At 0800 August 05, seventy two hours after our departure from Hilton Head, we pulled into Little Creek, VA to find a fuel tank cleaning service and to trouble shoot the high oil temperature with the stabilizer cooling system. We hired Dave of USA Fuel Service in Norfolk to ‘polish’ the 1000 gal on board, and to open and clean the tanks. His educated guess on the source of the ‘Golden Slime’ was that the tanks had been filled with biodiesel which will gel if not used within 90 days. Many of our delivery problems have been fuel related but this was our first encounter with ‘Golden Slime,’ and hopefully our last. While Dave was busy with his fuel wand and portable dockside filter system, we discovered that the stabilizer cooling pump made lots of noise but did not pump any water. Fortunately there was a spare March Pump in the very extensive spares inventory, we installed it and tested it, and instantly there was cooling water. At 1000 August 7 we departed from Little Creek for Newport with a continuing good weather forecast. The remaining 360 miles were pleasantly uneventful, and we arrived at Newport Shipyard on August 9 at 1500. We spent the next day cleaning the exterior, cleaning and organizing the interior, and generally making the ‘Serena Ray’ soon to be renamed ‘Never Say Never’, ready for the new owners arrival.